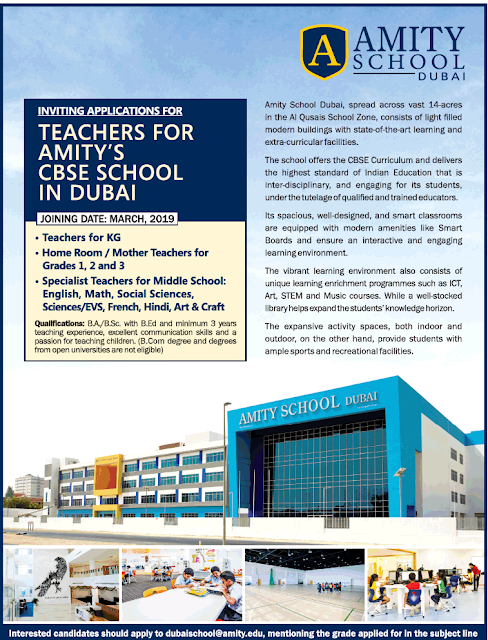 Amity School, Dubai has advertised in THE TIMES OF INDIA newspaper for the recruitment of Teachers jobs vacancies. Interested and eligible job aspirants are requested to apply immediately from 06th February 2019. Check out further more details below. About School: We believe in a holistic educational model that focuses on developing different stages of a child’s growth, academically, socially and emotionally. We encourage enquiry and engage our students in interactive lessons. Interested and eligible candidates are requested to send application along with CV, copies of certificates and recent passport size photo to the email address given below. Mention the grade applied for in the subject line of email.